In June 2011, I had published a column on my blog at emergic.org titled “Project 275 for 2014.” It suggested that the BJP should aim to create a wave election (instead of focusing on state-specific aggregation) to win a majority on its own. At that time, the previous highest for the BJP was 182 seats. From this 275 figure came BJP’s Mission 272+ strategy. Politics is the modern art of warfare. It is all about capturing territory. Elections are expansion opportunities. BJP has in the past few years mastered the art of empire – working hard to grow with every election. Today, the states they are in power cover 70% of India’s population. So, what will the BJP do in the next election? Let’s first understand what really happened in the 2014 election. We all know BJP won 282 in 2014. But how did they win? The answer is “90% of 60%.” This theory was put forward by Praveen Chakravarty in a column in Business Standard five days after the results in 2014. He postulated that in 11 of the 19 largest states, NDA won 90% of seats. These 11 states make up 60% of the total of 509 seats in the 19 largest states (of the total 543 Lok Sabha seats). Hence, the phrase 90% of 60%. These states – primarily in the largely Hindi-speaking North and West – accounted for 232 of the 282 seats the BJP won. What can BJP then do to aim for a majority on its own in the next election to ensure Narendra Modi continues as Prime Minister for one more term. So, the first and easiest step is to see if 90% of 60% can be repeated in the next election. But there is a problem, because governance has not been up to the mark – jobs for youth and income growth for farmers being the two biggest troubles. 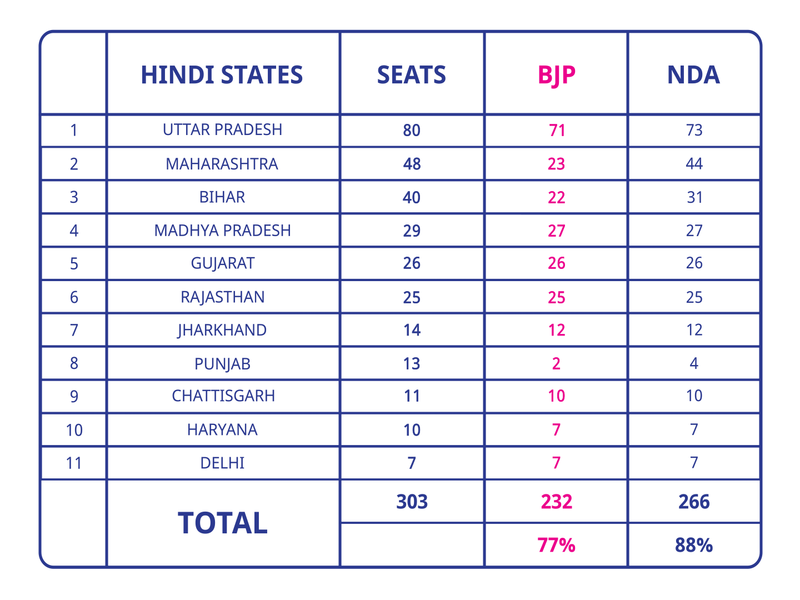 BJP could lose 60-70 seats in the Hindi belt. BJP realises that losing anything more than 50 could jeopardise Modi’s position to lead the BJP after the election. So, what does BJP do then? Remember that the BJP is led by Narendra Modi – the smartest politician India has seen in at least the past 40 years, if not since independence. It is also thinking big and long. With the force of Modi’s leadership and the momentum, if the BJP cannot build the party nationally in every neighbourhood of the country, when else will it do it? Mission 272+ of 2014 must therefore become Mission 543 for every BJP worker – fight to win every booth, block and seat in India. And so, four strategies come to mind. 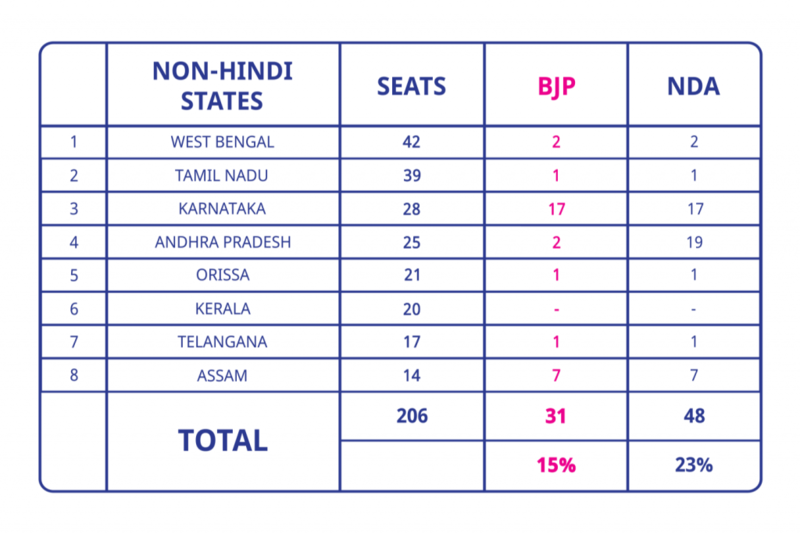 The BJP targets the non-Hindi states where it just won 31 of 206. In these states, try and become the principal opposition party so mistakes by the ruling party can result in direct benefit to BJP. BJP targets the remaining 34 mainly in J&K, North-East and the Union Territories, where it won 19. It works to grow especially in the North-East. These put together could add 10-15 seats in the next election. But it is still not safe zone yet. That is where a third strategy emerges – the 52 seats won by the NDA partners, primarily in Maharashtra, Bihar, Andhra Pradesh. BJP decides to dump the partners and fight on its own. Only when a party contests a seat does it start to build the booth-level presence that is so needed to start winning. Let us take a closer look at Maharashtra, Bihar and Andhra Pradesh. In Maharashtra, as the Assembly elections and Municipal elections have shown, it is possible for BJP to transfer a chunk of the Shiv Sena’s votes to itself. So, why not all the way? In Bihar, BJP’s voteshare has been stagnant in the mid-30s. In fact, by splitting with the JD(U)and going its own way can help counter anti-incumbency, especially now that Lalu Prasad Yadav is out of the way. Andhra is interesting because there are governance challenges in the state after the split. BJP has long wanted to open up a chunky territory in the South – no better bet than Andhra. Perhaps, the Andhra-ites could be persuaded to try BJP’s governance model, as Tripura did. This focus on “Mission 543” can thus help explain the decisions to part ways with the Shiv Sena in Maharashtra and TDP in Andhra Pradesh. It does not matter who made the final call – as the big brother, BJP had the final say to stay or split with its partner. BJP has to completely isolate the Congress. By tagging Congress leaders in some states with the corruption tag, the BJP will make it harder for others to ally with the Congress. This is already being played out in Tamil Nadu. Think of this as Plan B – to increase distance between with the Congress to such an extent that there is no other game in town should the BJP need post-poll alliances. The BJP thus makes it very difficult for the opposition parties to counter it on corruption. The message to every senior leader of the Congress or a regional party is that the BJP government will very likely come after them with its central investigative agencies. At the end of the day, they all are roadblocks in BJP’s Mission 543. The seeming inability to repeat “90% of 60%” framework has thus given birth to BJP’s Mission 543. By fighting every inch of India in an election in the name of Narendra Modi, the BJP is giving itself the best possible chance of maximising its seats. And the moral of the story for regional parties is: first focus on protecting your territory because the BJP is coming down hard. Does this guarantee BJP a majority in the next election? Not so fast! If voters continue to face economic hardship and discontent rises, they may look past the ‘mayajaal’ woven by the BJP and start considering alternatives. Even with strong control on the narrative in traditional media, the BJP will find it hard to limit the flow of negative messages on Facebook and WhatsApp, as has already started happening since last September. Also, the vacuum of the “alternative to the BJP” could be filled in by a political startup with a single-minded focus on crushing the anti-prosperity machine because Indians are still waiting for their First Prosperity Prime Minister.